and my challenge for everyone is - Through the Looking Glass . Let's make a project involving glass (acetate?) or mirrors (metal sheet? ), perhaps a window or a clock face, a hand held mirror or glass bottle. Tim has lots of Idea-ology products and dies that would be just the thing for this challenge. 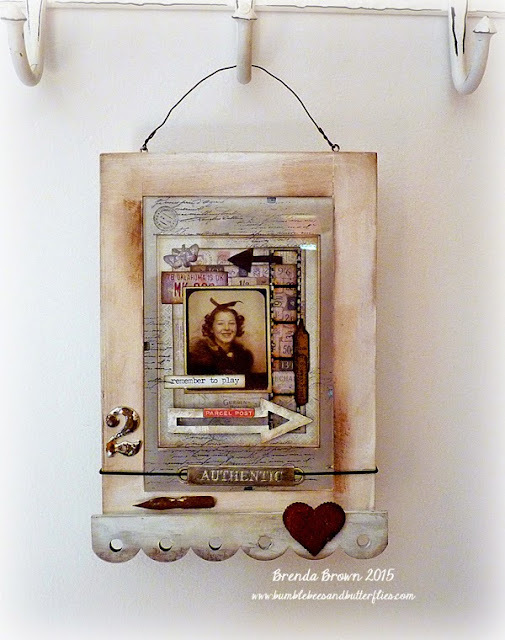 We are a Tim Holtz inspired blog. 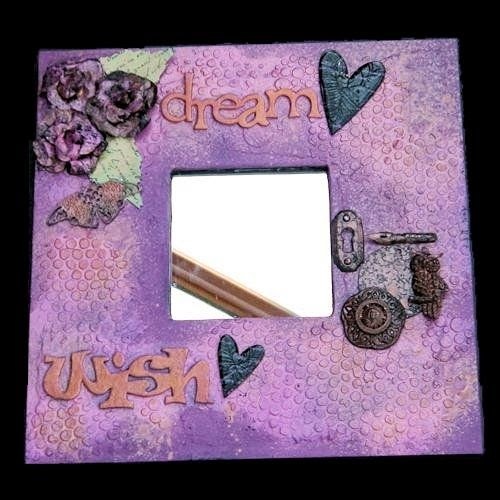 However, you do not have to use Tim Holtz or Ranger products (although we love when you do!). Just let us know how you were influenced by Tim's style when you write up your blog post for your project. Following are some very lovely and creative projects by the AVJ Creative Guides to inspire you! First up is my 'Through the Looking Glass' project. I started out my project just making the hand held mirror using Tim's Die and Distress Stains and Idea-ology pieces as a creative Birthday card for my Grandniece who is turning 1 this month - then I decided I needed something to lay the mirror on - so I created this little bureau (with a mirror on it!) using 4 more of Tim's dies. You will find more pictures than you really care to see and details on how I created both of these on my blog post here! Whilst browsing through Pinterest (anyone else lose hours doing that?!!!) I came across a set of boards from Savvy City Farmer which included antique furniture and mirrors. 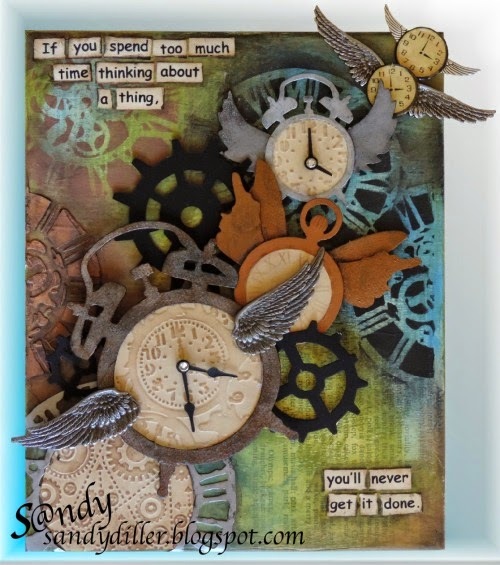 The cogs started whirring and, in one of those 'what if' moments, I came up with an idea for ageing a Tim Holtz Idea-Ology Mirrored Sheet. Find out more about it on my blog. 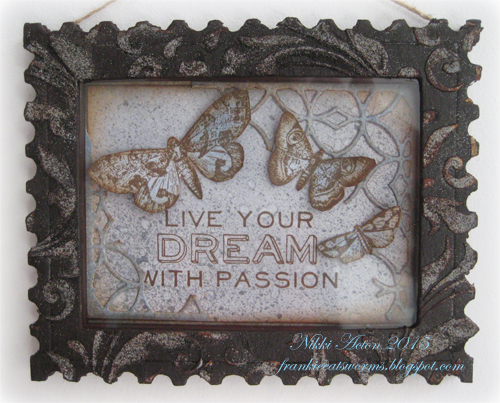 I decided to make a mini picture frame using the postage stamp die and acetate for my 'glass' front. 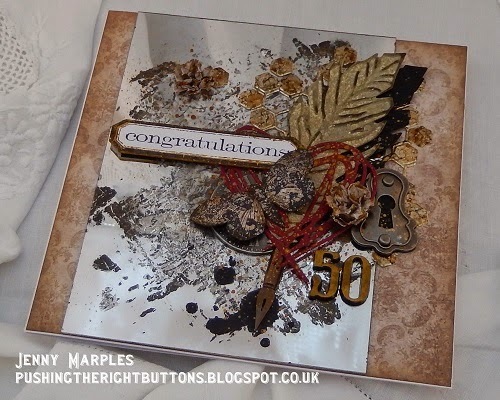 I had great fun with paints, texture paste, embossing powder, mixed media thinlets and lots more. There are more details over at Addicted to Art today. I so loved the challenge Julia gave us and took the challenge quite literally! Using a few Tim elements all about looking through or at! 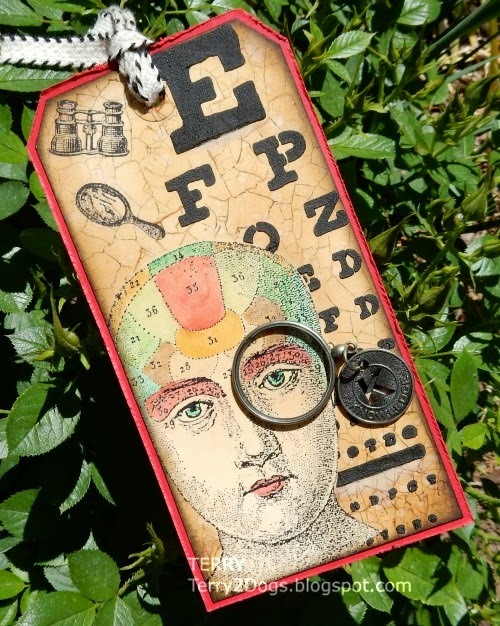 My inspiration was in fact that I need to make an eye appointment, so it just went from there! For all the details, please visit me HERE. My lovely teamie, Terry and I had the same thoughts, following a visit to the Optician! I have used similar techniques to Tim's March tag, using stains rather than paints. Please visit my blog if you would like to see more. What a fabulous theme from Julia! I headed for the acetate (piles and piles of hoarded packaging waiting to be used) and created some glass bottles with the Apothecary Bottles die. I used a combination of crackle and gloss glazes to create dimensional "glass", and I'm really pleased with the finished effect. Do hop over to Words and Pictures to see some close-ups! I just did not know which 'rabbit hole' to travel down with Julia's fantastical challenge theme for April. Do I make some Apothecary Bottles? Do I use a facet or a monocle somehow? What about my corked vials and domes? I ended up taking a more literal route and created a window, that was once painted over, for this rustic little beach hut. Please stop by my blog for more details. I loved the challenge of Julia's theme for April, it really got me thinking in all sorts of directions. In the end I opted for an 'open' wooden picture frame (it doesn't have a back to it) creating one of my A34 (Artist 3x4s) using Tim's papers and his ephemera. 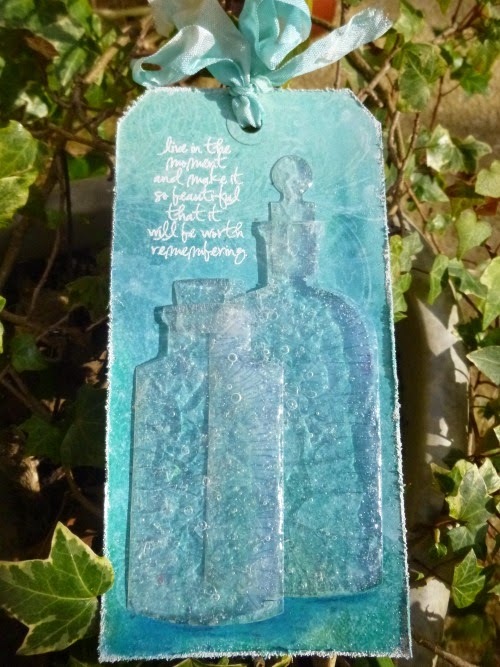 I bought a roll of transparent film to adhere it under the glass then stamped the text and added the arrow over it. I love the way you can see right through it. Please visit my blog for more details. This is such a fabulous theme and I conjured up something "Alice in Wonderland" for me. So now it's time for you to create "Through the Looking Glass". We look forward to seeing how you are inspired by this challenge! The AVJ challenge is now a monthly challenge and one randomly chosen winner will receive a £20 gift voucher from our very generous sponsor, Country View Crafts. We will continue to have our Pinworthy blog badges for the Top 3, who will be chosen by the Creative Guides (DT). You have until April 30th at 6:00 pm GMT to link up your creation! Oh man I just posted a glass project this morning and in my time zone it's still the same day as this new challenge. Hehe... Love everyone's projects. I hope I can play, play, play! What a fabulous challenge! I had a real feast this morning seeing the works of all the creative guides...amazing! Hope to play along soon. Wow ladies - you outdid yourselves! So many lovely creations brought to mind from the inspiration "through the looking glass' thank you all for joining in with me! Can't wait to see how it inspires all the AVJ fans!! Link 'em up ladies!! 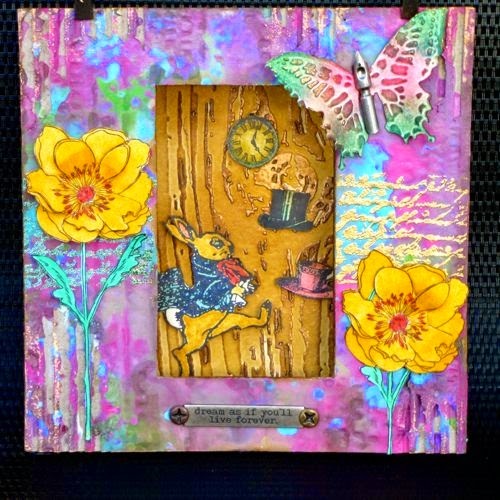 Wonderful new challenge theme Julia and what amazing inspiration from the DT, can't wait to give it a try! Truly a challenge! I love all your inspiration projects team, which gave an idea, how this theme can be interpreted. Fabulous creative projects from you all ladies, can't wait to see the details of them. See you later, - this is such a great challenge theme!! 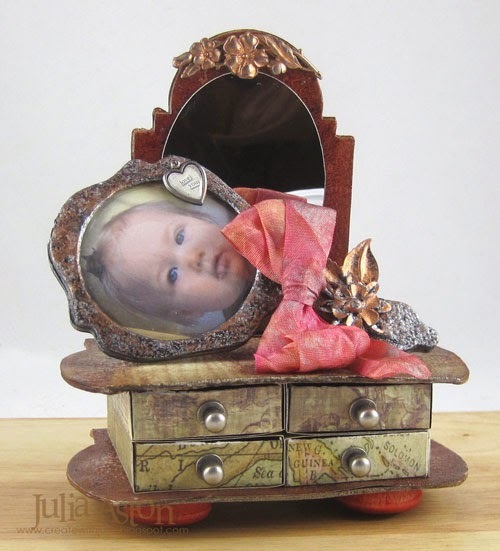 Love the range of ideas from all of you on this fabulous theme, a great choice Julia. 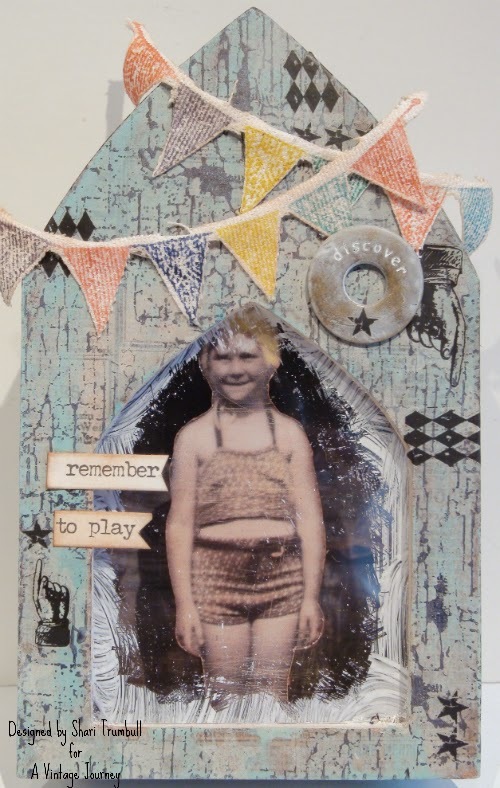 Wonderful and fun challenge theme, Julia! Love the varied DT interpretations and all the projects are fabulous! I had a blast reminding myself to get those eyes checked out! Can't wait to see all the entries! Happy Easter to all! Fabulous work all round again... just been enjoying a close-up view of them all! Great chellenge theme, Julia! All the projects are awesome! Happy Easter to all! Just popped around everyones blogs. Super diversity and great step by steps to all your projects. Great challenge Julia. Fabulous makes and different sources of inspiration for us! Thanks talented ladies! Hi Kerstin I have left a reply on your recent blog post. You can also check out our challenge rules for more information.